Channel Islands National Park consists of 5 of the 8 Channel Islands off the Santa Barbara coast. Although the islands are close to the shore, their isolation has left them relatively undeveloped. The northern Channel Islands are Anacapa (1.1 sq mi), San Miguel (14.6 sq mi), Santa Cruz (96.5 sq mi) and Santa Rosa (83 sq mi) and the southern islands are San Clemente (57 sq mi), San Nicolas (23 sq mi), Santa Barbara (1 sq mi) and Santa Catalina (75 sq mi). Channel Islands National Park includes the islands of San Miguel, Santa Rosa, Santa Cruz, Anacapa and Santa Barbara. Anacapa is located in Ventura County while the other four are in Santa Barbara County. San Clemente Island, the southernmost Channel Island, is owned and operated by the U.S. Navy. Catalina Island as we know with its population of 3,700 is a popular tourist destination. 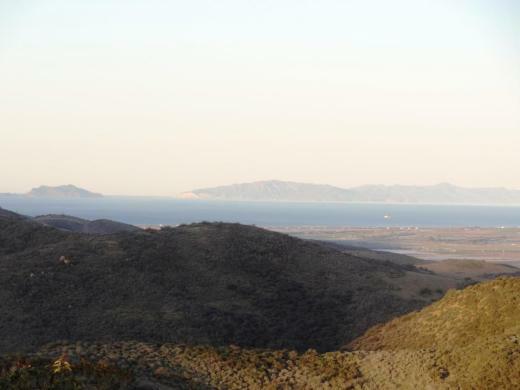 San Nicolas Island in Ventura County is also controlled by the U.S. Navy. On a clear day you can see two of the five islands, Anacapa and Santa Cruz. Visitors to the islands may swim, snorkel, hike, camp, watch wildlife, sail and explore tidepools, beaches and canyons. There is no food service on the islands, so bring what you need. Take a commercial service to the islands like Island Packers, which has been servicing the islands since 1968. Landings at Anacapa and Santa Cruz islands are year-round while the more remote outer islands, Santa Barbara, Santa Rosa and San Miguel are scheduled late spring through early fall. Visit the National Park Service website at www.nps.gov/chis to learn more about visiting Channel Islands National Park. The park is open year-round. The Robert J. Lagomarsino Visitor Center at Channel Islands National Park is located in the Ventura Harbor at 1901 Spinnaker Drive (805.658.5730) and the Outdoors Santa Barbara Visitor Center is located at the Santa Barbara Harbor at 113 Harbor Way, 4th Floor. On a clear day you can see two of the Channel Islands from Newbury Park and other Ventura County spots. Here's a view from the Rancho Potrero Open Space in Newbury Park. Anacapa Island seen from a whale watching boat. Sycamore Cove Beach is located at 9000 Pacific Coast Highway in Point Mugu. 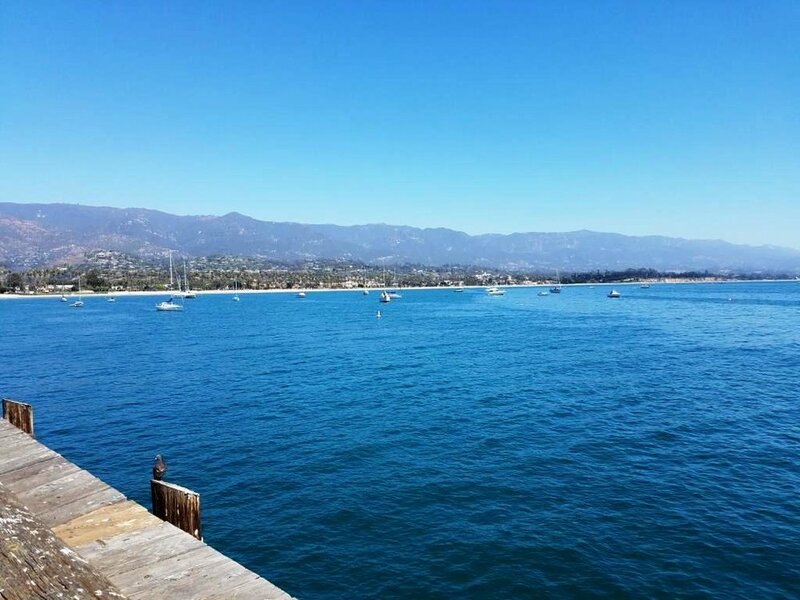 The beach is one of the closest and easiest to get to from the Conejo Valley and Camarillo via Las Posas and PCH. Sycamore Cove Beach in the background. Sycamore Canyon Campground entrance on left. The beach is popular with families looking to barbecue and enjoy quick and easy access to the beach. There are also porta-johns and restrooms available. Very limited parking on PCH (read the signs carefully as you don't want to get ticketed) but plenty of paid parking available (generally $12 to $14 for the day). A view of Sycamore Cove Beach from the south. On the northwest end of the beach you can walk underneath PCH to the other side of PCH, where Sycamore Canyon Campground is located. From there, you can take Sycamore Canyon up to Newbury Park (about eight miles). Due north of Sycamore Cove Beach is Thornhill Broome Beach/Campground, which along with Sycamore Cove and Sycamore Canyon is part of Point Mugu State Park. Across from Thornhill Broome is the large sand dune that makes for some fun climbing. The humongous sand dune walking distance from Sycamore Cove. Visit www.parks.ca.gov/?page_id=630 for more information. My kids and I love going to the beach but for many years we seemed to go to the same ones all the time. So I stopped by the Automobile Club and asked them if they had a brochure on all the local area beaches open to the public. They shrugged their shoulders and said no such guidebook existed. They handed me a fold out map, which was of no use to me as I wanted to know exactly how to get to these beaches, if they have restrooms, parking, etc. Then I started searching around for information and found bits and pieces in various locations that were marginally useful. So I decided to consolidate this information into one place where I could find out about where to go to the beach around Ventura County on up the coast to Carpinteria and Santa Barbara and down to Malibu. So I hope you find the following links helpful in finding local area beaches in Ventura County and surrounding areas! This took a lot of time to compile over 60 local area beach areas, so I truly hope you benefit from these lists! So enjoy and provide feedback if you have comments and/or additional information. At Leo Carrillo State Beach in Malibu. Windsurfers at Surfers' Point in Ventura. Rincon Beach Park is near the Ventura/Santa Barbara County line just a few miles east of Carpinteria. Just take the Bates Avenue offramp off the 101 Freeway. Take Bates to the ocean and on the right you'll find plenty of free parking and easy beach access, with picnic tables and restrooms. If you make a left turn off of Bates, there's a separate parking lot for Rincon Point, part of Carpinteria State Beach, one of the most popular surf destinations in the world. There are a couple of restrooms on this side also, albeit not particularly pleasant ones to use. Campfires are not allowed on the beach. To learn more about Rincon Beach Park or to reserve the picnic table, visit www.countyofsb.org/parks/parks02.aspx?id=8078 or call 805.568.2465. Point Mugu State Park is located in the Santa Monica Mountains, stretching from Newbury Park on the north to five miles of ocean shoreline on the south. The park includes 14,000 acres of land with over 70 miles of trails popular with hikers, cyclists and runners. It is truly an amazing place, with rocky peaks that include the prominent Boney Mountain State Wilderness that looks over the western Conejo Valley. The sign in Rancho Sierra Vista/Satwiwa in Newbury Park indicating you are entering State-managed Point Mugu State Park. You can actually hike, run or bike from Newbury Park, from the Rancho Sierra Vista/Satwiwa area managed by the National Park Service down to the ocean via Sycamore Canyon "Sycamore to the Sea," which is about an 8 mile trip one way. But do be aware - the initial 800 foot drop from Rancho Sierra Vista into the canyon via Big Sycamore Canyon Road is a bit more challenging coming back up. The paved hill drops into the canyon via Sycamore Canyon Fire Road. There are four main canyons in Point Mugu State Park. Sycamore Canyon is perhaps the most well known, stretching practically the entire north/south length of the park, where at the bottom of the canyon you'll find the 58 space Sycamore Canyon Campground at 9000 W. Pacific Coast Highway (make reservations at ReserveCalifornia.com). 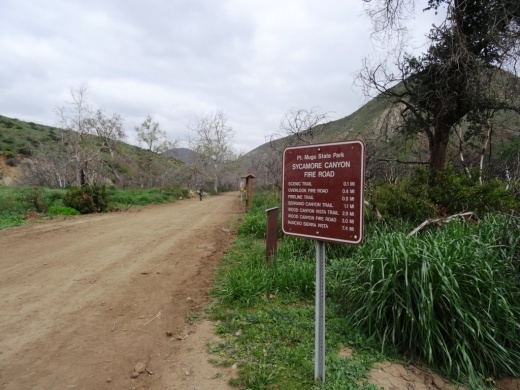 The Sycamore Canyon Campground connects to the Sycamore Canyon Fire Road, which is your access point to a day of fun and adventure in Point Mugu State Park trails. The La Jolla Valley Natural Preserve is on the western side of the park, with a main access point near Thornhill Broome State Beach at the Ray Miller Trailhead to the La Jolla Canyon Trail which connects with the Loop Trail. Another access point to La Jolla Valley is the Chumash Trail trailhead, a rocky, steep trail across from Point Mugu Beach. La Jolla Valley was purchased by the State of California in 1966 and was established as a Natural Preserve in 1972. Wood Canyon is in the northwest section of the park, where you will find the north/south running Wood Canyon Fire Road, which connects to the Guadalasca Trail, among others. Serrano Valley is accessible from the south off the Big Sycamore Canyon Fire Road/Trail about a mile north of the beach. A beautiful, serene, area, with a connection to the Old Boney Trail that takes you to the Danielson Monument in the Boney Mountain Wilderness. The main beach areas in Point Mugu State Park, running southeast to northwest, are Sycamore Cove, Thornhill Broome and Point Mugu. Sycamore Cove is a fun day-use park popular with families for gatherings with BBQ grills and picnic tables. 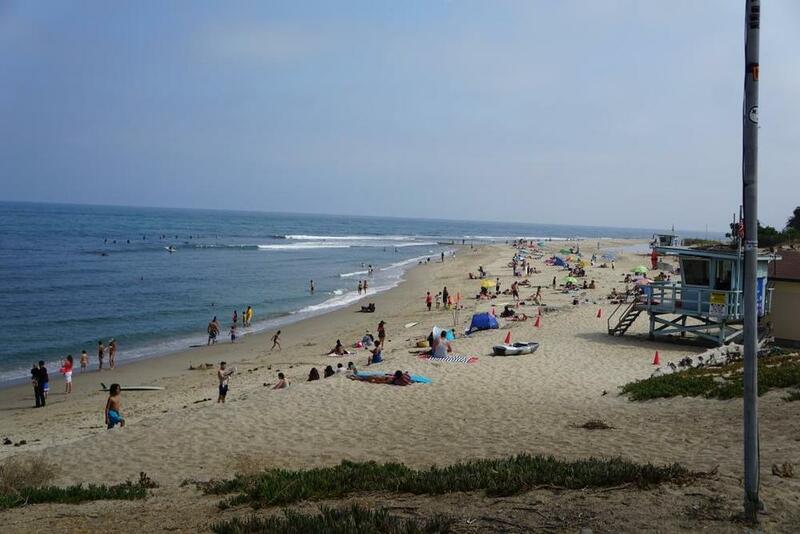 Learn more about beaches in the Malibu area at this link. This is the PCH overpass where on low tide you can walk underneath here to get from Sycamore Cove Beach to Sycamore Canyon Campgrounds and hiking in Point Mugu State Park. In higher tides, this area can be dicey, so be careful. If you are looking for beachfront camping, try Thornhill Broome Beach, with just over 60 spots available for RVs and tents. No hookups here and only porta-johns available, but can't beat the views! And across the street you can't miss the Giant Sand Dune! Day use parking at the various sites is available for $12. There is very minimal street parking at Sycamore Cove but plenty of street parking adjacent to Thornhill Broome Beach. Dogs on a leash are allowed in the Park's day use areas, campgrounds and beaches. Dogs are not allowed on the back country trails or dirt roads. Keep driving northwest on PCH and you'll past the famous Mugu Rock and see Pt. Mugu Beach, which also has day use parking, with some parking on PCH. Learn more at the California State Parks website at www.parks.ca.gov/?page_id=630. Mugu Rock up ahead, driving north on PCH from Thornhill Broome. Lastly, let's cover some of the highest peaks in Point Mugu State Park. The Boney Mountain Wilderness Area, ever so prominent from the Conejo Valley, is located in the Park. But Boney Peak itself, at 2828 feet, is actually in the Circle X Ranch area managed by the National Park Service, along with Sandstone Peak, the highest spot in the Santa Monica Mountains at 3111 feet. Boney Mountain range overlooks the western Conejo Valley. Other peaks include Tri Peaks at 3010 feet, Laguna Peak (the peak which has equipment from Naval Base Ventura County below), La Jolla Peak and Mugu Peak. 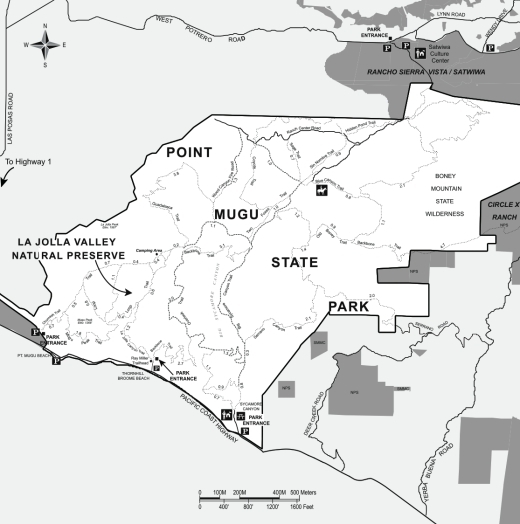 Map of Point Mugu State Park courtesy of National Park Service. Rincon Point is home to one of the most popular surfing spots in the world. Accessible near the Ventura/Santa Barbara County line just a few miles east of Downtown Carpinteria. Take the Bates Avenue offramp off the 101 Freeway towards the ocean. On the right is access to the City of Carpinteria's Rincon Beach Park and on the left is access to the Rincon Point parking area. Open 6am to 9pm daily, with a not-particulary-nice porta-john available in the parking area. There is a trail that takes you to the beach area from the parking lot. The area is also surrounded by beach homes. A view toward the north from Rincon Point (in the direction of Rincon Beach Park). Leo Carrillo State Park has 1.5 miles of beach for swimming, surfing, windsurfing, surf fishing and beachcombing, as well as tide pools, coastal caves and reefs for exploring. Giant sycamores shade the main campgrounds. The park also features back-country hiking. Among the many great features of Leo Carrillo, the most engaging activity for me and the kids is the tidepools. They are exposed twice daily at low tide and provide hours of engagement with sea stars, anemones, mussels, sea slugs and more amongst the thousands of rocks on shore. Nature walks and campfire programs are offered and a small visitor center has interpretive displays. During the summer, children's programs are available. 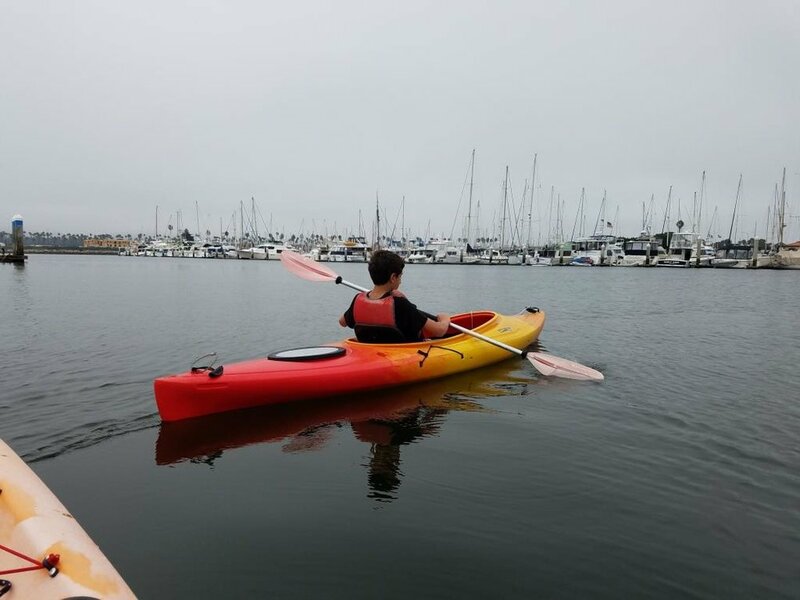 Trails include Yellow Hill Fire Trail for panoramic views of the beach and the Channel Islands, and the steeper Nicholas Flat Trail, which brings you to a pond. A view from the Leo Carrillo bluffs as the clouds start rolling in. There are 135 family campsites at Leo Carrillo with restrooms and token-operated showers (which accept ONLY one dollar bills...plan ahead). Call 800.444.7275 or visit www.parks.ca.gov to make reservations. The park was named after Leo Carrillo (1880-1961), actor, preservationist and conservationist. Leo Carrillo served on the California Beach and Parks commission for 18 years and was instrumental in the state's acquisition of the Hearst property at San Simeon. Leo's greatest fame came from his portrayal of Pancho, the sidekick to Duncan Renaldo's Cisco Kid, an early 1950's TV series. Leo Carrillo State Park is located at 35000 W. Pacific Coast Highway in Malibu. The park office phone is 310.457.8143. Visit www.parks.ca.gov/?page_id=616 for more information. Parking is currently $12 in the parking lot for the day (or $3 per hour)...but free on PCH if you can find a nearby spot. There is plenty of parking spots available in the lot. After you park, you can walk in a tunnel underneath PCH to get to the beach. The muraled tunnel that takes you underneath PCH to Leo Carrillo Beach. The most direct way of getting to Leo Carrillo from the Conejo Valley is via Westlake Boulevard (CA-23) (aka Decker Canyon) south, which for some is a fun 14 mile drive, but for others, not so much. It is a bit winding, hilly, steep at many junctures. I take this route during daytime hours but coming home I'm not too keen on it. After getting to PCH, turn right and drive 2 1/2 miles to get to Leo Carrillo. Another more popular, though less direct route is via Kanan Road. Either take Kanan Road straight down to PCH, turn right (west) on PCH about 9 miles to Leo Carrillo, or take Kanan to Encinal Canyon, which is about a 3 mile drive on PCH to Leo Carrillo. Lastly, if you are in Newbury Park, you can take Potrero Road west to Las Posas down to PCH. In about 11 miles you will reach Leo Carrillo.